second East African nation announced Thursday it will launch a fully automated drone delivery program. The drones will fly themselves, far from the view of humans -- a move that's not yet legal in the U.S. While plenty of countries have dabbled in drone delivery, no program has matched the scale and impact of what's unfolding in Rwanda and now, Tanzania. In early 2018, Tanzania's government will begin using drones to deliver medical supplies such as blood and vaccines to remote areas. The government expects to save lives thanks to faster delivery of medical supplies. Rwanda has already completed 1,400 similar deliveries. "Everyone has this paradigm that robotics and artificial intelligence starts in the U.S., made by rich people for rich people. 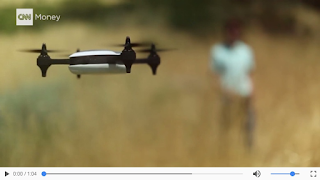 It couldn't be farther from the truth," said Keller Rinaudo, CEO of Zipline, which is supplying the drones. "There's a major shift [occurring] where it's not about the country with the most resources; it's more about the countries with modern regulatory reform and a willingness to try new things." Tanzania will open four drone distribution centers with Silicon Valley startup Zipline, providing more than 100 drones and 2,000 flights a day. It's also discussing a partnership with another drone company. In little time, Tanzania's government sentiment around drones has shifted from "nervous" to "excited" according to Laurean Bwanakunu, who leads the government agency responsible for procuring and storing medical supplies to the country. Leaders figured the system couldn't work -- and if it did, a drone couldn't carry more than a few pounds. "If an African country like Rwanda is doing it, and it's just a stone's throw away from where we are, why not us?" Bwanakunu said. "The issue is being able to dare and try it. We made a decisions as a country that we wanted to move forward." The government is confident the autonomous drones will be safe. Bwanakunu's group received permits from its aviation authority and minister of defense. The drones are required to stay below the height of traditional aviation and give airports a wide berth. They include a parachute that deploys if that anything goes wrong. This isn't the first time East Africa has been a step in front of the "developed world." "We were ahead with mobile money too," said Bwanakunu, referring to M-PESA, which allows for money to be sent through cell phones. "If today trying this technology will save a human life, why not?" Basically drone can be used for air strike and to make the video recording from the sky of origins point, however in know a times the drone has become very common and they're using to make video of the marriage event and other spying videos, and then for many of these purposes this selfie drone is very helpful for everyone.